Fiat Chrysler is moving forward with a Jeep Wrangler pickup, but if it were to sell us a direct competitor to the current midsize Chevy Colorado or Ford Ranger, it’d probably be this new Mitsubishi L200, also called the Triton. The Triton is Mitsubishi’s newest version of its traditional body-on-frame pickup out of Thailand. Thailand is the home market for the aforementioned Colorado and Ranger, as well as the Hilux and a host of other Toyota variants. I’ll save a bigger explainer for later on why all of this truck development and production happens in Thailand, but this really is the hub for global truck design outside of the United States. We do full-sizers, Thailand does midsizers. I don’t know exactly why this L200/Triton is listed as a 2020 model, but it’s an update of the current generation of truck available since 2015. You’re basically getting Mitsubishi’s new corporate face on an existing truck. While being as tall as a current Chevy Colorado, it’s a few inches narrower (72 vs 74 inches) with nearly a foot less wheelbase (118 vs 128 in) and half a foot less length (205 vs 210 in). Buyers in places that are not America get a bunch of different turbo four-cylinders, gas and diesel, to power the thing, all of which make horsepower figures in the mid 100s. Weight figures, meanwhile are from 3,000 to 4,000 pounds from lightest to heaviest. Full specs, if you’re curious, are here on Mitsubishi’s website. The reason why I bring up Fiat Chrysler is that You can buy the L200/Triton as both a Fiat and as a Ram truck in Europe and the Middle East, respectively. It’s part of a deal announced back in 2016. 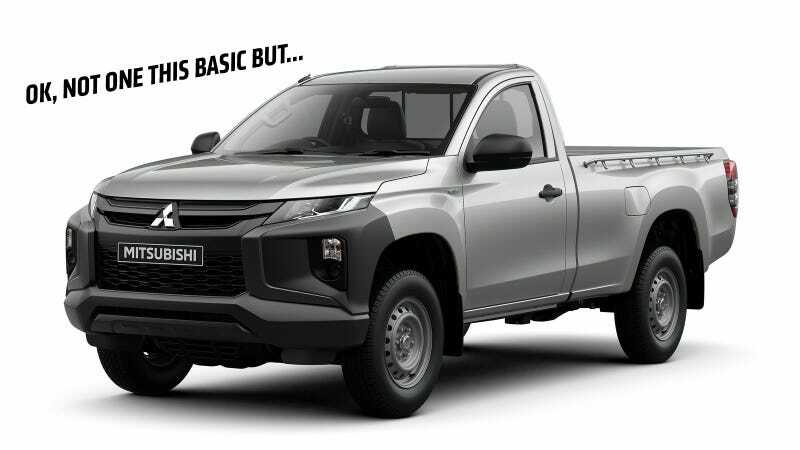 If Ram were to want to send Americans a midsize Thai truck to compete with what GM and Ford are doing in that space, this Mitsubishi would be perfectly tee’d up for it. Of course, there’s the Chicken Tax in the way, and the general success of Jeep, too. But if Ford and GM are doing it, maybe it’s not a bad idea?